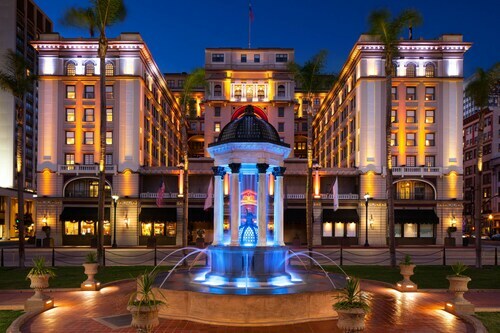 The palatial US Grant is in the center of downtown San Diego, facing the Westfield Horton Plaza retail and entertainment complex, and adjacent to the Gaslamp Quarter's vibrant nightlife and myriad restaurants. 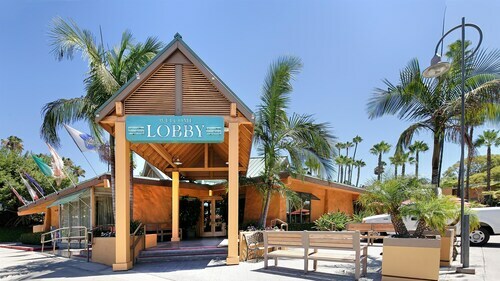 With direct access to the beach, this Carlsbad resort is within 3 mi (5 km) of Flower Fields of Carlsbad, Legoland California, and Carlsbad Premium Outlets. Carlsbad State Beach is 2.1 mi (3.3 km) away. 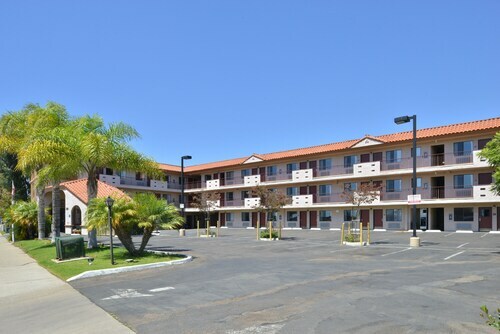 How Much is a Hotel Room in San Diego County? 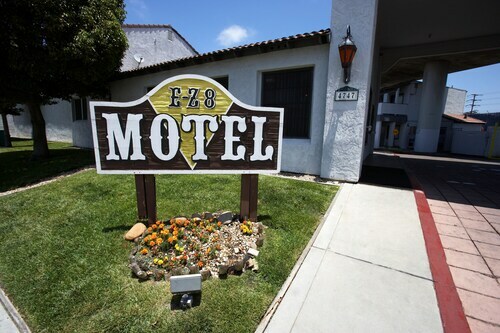 Hotels in San Diego County start at C$76 per night. Prices and availability subject to change. Additional terms may apply. It’s called Sunset Cliffs for a reason. From your vantage point a few dozen feet above the breaking surf, you’ll enjoy an amazing view of the glowing golden orb as it dips into the steel blue Pacific. If fortune shines upon you like the glorious San Diego sun has all day, you might catch a glimpse of the elusive and ethereal Green Flash—when a verdant dot remains visible for a brief moment after the sun has already dipped below the horizon. After nature’s light show, head back to your San Diego hotel and freshen up for an evening of urban excitement. There’s probably no city with a more fitting nickname than that of San Diego. 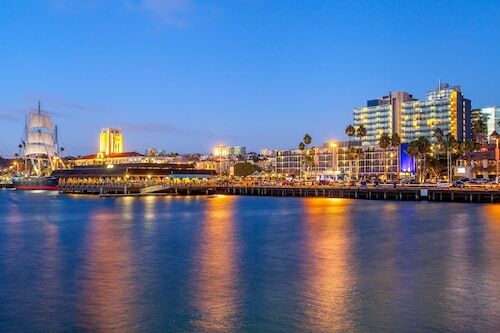 With its location on the sparkling blue waters of the Pacific Ocean and ridiculous amount of sunny days, San Diego truly deserves the moniker of “America’s Finest City.” Whether you’re going for a stroll in the sand as the tide washes over your feet or you’re exploring the bustling avenues of downtown, our San Diego hotel deals will help you find a perfect home base. The sun, the fun, the surf, and the sand blend together to make a trip here unforgettable. 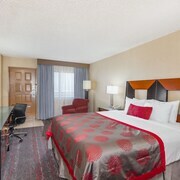 And when you book your stay through Travelocity, you’ll save enough to experience everything San Diego has to offer. 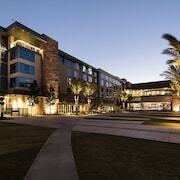 What Are the Best Places to Stay in San Diego? San Diego is very much a beach town, but its downtown area is also every bit a true major city center. 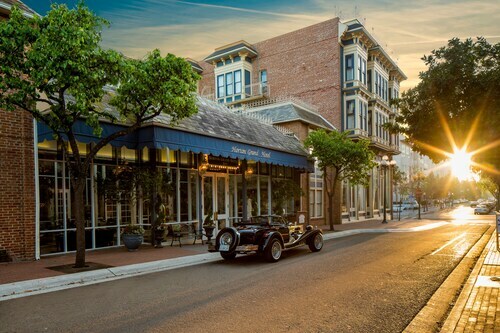 The Gaslamp Quarter alone has enough boutiques, eateries, and nightclubs to give SoHo, The Magnificent Mile, and Rodeo Drive a run for their money. Add to that a renowned theater scene and the San Diego Zoo in Balboa Park, and you have a downtown on par with any in the states. 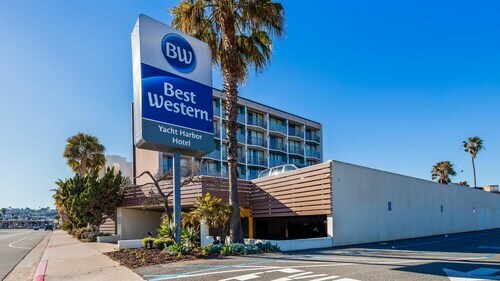 Wyndham San Diego Bayside – Not only is the Wyndham less than a mile from the airport and a short walk from the attractions downtown, it is also situated on Harbor Drive next to Waterfront Park. Talk about an ideal location! That’s not all the hotel has going for it. With sweeping views of the city skyline or the setting sun, you may not want to leave your comfortable guest room…unless it is to explore the city on one of the Segways you can rent on-site. 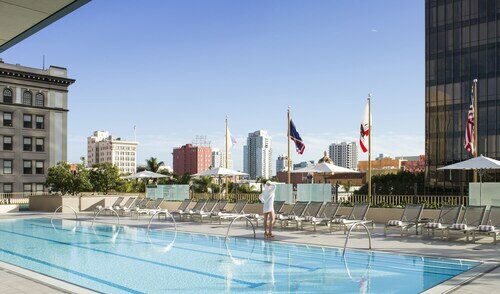 Manchester Grand Hyatt San Diego – Just steps from the San Diego Convention Center, the excitement of downtown, and the attractions at Seaport Village, the Grand Hyatt welcomes travelers of all kinds. Coordinate your event at the convention center with a meeting in the hotel’s 300,000-plus square feet of flexible space. Enjoy a relaxing treatment in the Marilyn Monroe Spa, then down a nightcap while watching the sunset from the Top of the Hyatt, the 40th-floor lounge. San Diego has two bays. The San Diego Bay is primarily for work, as it’s home to three Navy properties and multiple shipping companies. Mission Bay, on the other hand, is all about recreation. Hop on a paddleboard, rent a sailboat, or take a leisurely wine cruise—you really can’t go wrong. 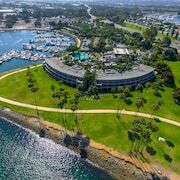 Catamaran Resort and Spa – Add a touch of the exotic to your San Diego vacation. 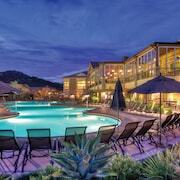 This Polynesian-themed resort is tucked away in a secluded corner of Mission Bay. Your guest room doors open up to a grassy lawn that leads you right to a private bay beach. Want to experience some bigger waves? The Pacific Ocean is just three blocks away. After you’ve washed your cares away in the refreshing waters, enjoy a sunset luau back at the resort. The Dana on Mission Bay-BW Premier Collection – Situated on a small outcropping in the middle of Mission Bay, the Dana is far away from the hustle and bustle of the city. If you play your cards right, the only thing that will remind you of outside civilization will be the nightly fireworks from nearby SeaWorld. Spend your day getting pampered at the on-site spa, count the kayakers float by on the bay from the resort’s private beach, or rent a boat from the private marina and get out on the water for yourself. We’re not fortune tellers, but we can see a trip to the shores of Southern California in your near future. All you have to do is book one of Travelocity’s great deals and leave your everyday worries behind you—you won’t need them for a while. 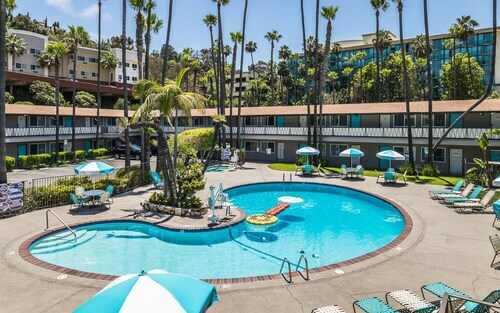 Whether you need an upscale resort by the bay, one of the luxurious downtown San Diego hotels, cheap lodging around town, or accommodations anywhere in the area, Travelocity can save you money in a flash. Speaking of flashes, there’s one thing we didn’t tell you about the Green Flash: It only can happen if you are there to witness it. The property was very nice. The front desk were extremely friendly and helpful. There was a slight musty smell in the bedroom, but there were lavender caches on the bed, which was nice to try. The pillows were a little hard for me but that's just personal preference. I would definitely stay there again. 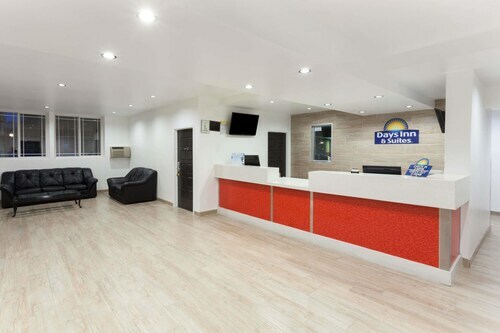 Clean, well presented and warm welcoming friendly staff. Good location. Staffs are very kindly. Room was big and clean. 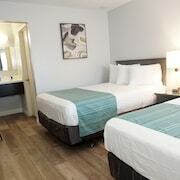 The staff was very pleasant and helpful... the rooms were very as well the showers.